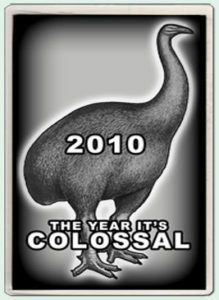 Today, you are a member of... 2010: THE YEAR IT'S COLOSSAL - You Are A Member! Don’t think big, Members. Don’t think merely giant, (though giant is pretty hot, yes?). Don’t think large, or XXL or venti for crying out loud. No, it’s MMX and indeed this January 1st, it’s time to step it up a galactic knotch or two. That means getting your concepts to expand like Jupiter’s ribcage while he inhales all 11 string theory universes in order to exhale megafauna, godzilla, and ancient gladitorial structures writhing with Romans and roaring almighty – that’s the mission for your mind over the next 365 days. Because it don’t matter if this here orbit gets the thumbs up or the thumbs down – 2010 is the year It’s Colossal!